Although I love wearing makeup, there are few things I love more than removing my makeup and applying my skincare. For me, cleansing is one of those magic moments in the day where no matter how busy you are, you can take a few minutes to cleanse and pamper your skin. I adore cleansing and have tried every formula and cleanser type going, but my favourites are always cleansing balms. I enjoy massaging them into my skin as they melt my makeup away and leave my skin looking fresh and clean. A balm cleanser I can't get enough of at the moment is the Temple Spa In the Beginning Deep Cleansing Melt. It's a cleansing balm a lot of beauty bloggers and skincare experts have raved about and I don't doubt you'll find one in every bathroom of anyone who loves a good cleanser. I couldn't wait to give it a try for myself to see what the fuss was all about and whether it'd make it onto my love list for cleansing products. 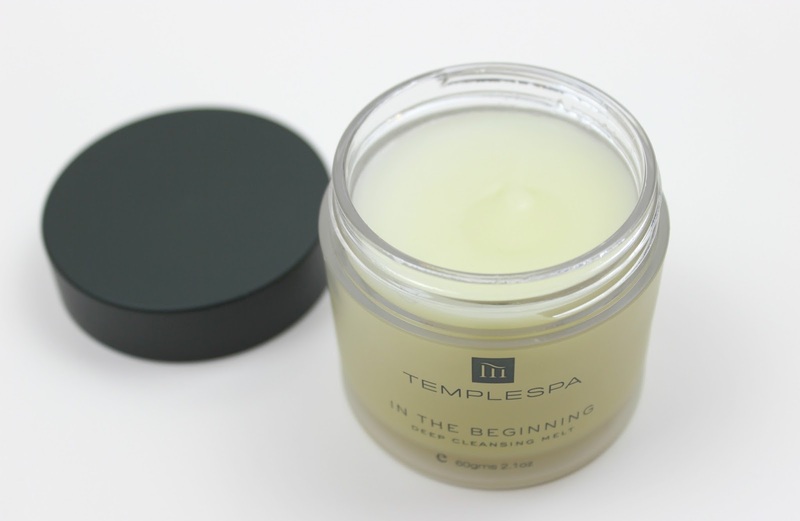 Like all Temple Spa products, it's not dressed up in fancy packaging, opting for a simple design with a softly frosted glass jar with a black lid and the Temple Spa branding. The cleansing balm itself has been hand-blended and features Mediterranean botanicals. Key ingredients are Calendula, Clary Sage, Lavender, Vitamin E, Olive Oil and Basil, all of which give this cleansing balm a beautiful refreshing and slightly herby scent. I personally love scents like this because it reminds me of facials and spa visits, so I find it quite a relaxing scent and one very lovely to work with when cleansing. It's not too overpowering, so don't worry if you're not usually one for a scented cleanser. The consistency is lighter than I expected, a soft balm which contains tiny exfoliating beads which help to exfoliate skin in a very gentle way, melting into the skin. As you massage in the balm it effortlessly cleanses my skin and helps to clear away any dirt, impurities or makeup, leaving my skin feeling amazingly soft. After massaging into my skin for a couple of minutes I lightly massage in some warm water before wiping away with a warm facial cloth. My skin afterwards, whether I've been bare faced all day or worn makeup, is left looking clear, refreshed and brighter, feeling much softer and smooth to the touch. I actually think this balm helps my toners to be even more effective and I've found it helps in tackling my dehydrated areas such as the centre of my forehead. It's just a really beautiful cleansing balm to use and leaves skin feeling absolutely lovely! If you've been after a new cleanser, the Temple Spa In the Beginning Deep Cleansing Melt is a lovely product to add into your skincare routine. Available online at www.templespa.com,60g RRP £30. I'm not familiar with the brand but the product sounds and looks really nice! :) I think it's going on my beauy wish list!